Yossi Milo Gallery is pleased to announce an exhibition of photographs by Ezra Stoller (American, 1915–2004). The exhibition will open on January 6 and close on February 12, with a reception on Thursday, January 6, from 6:00 to 8:00 pm. 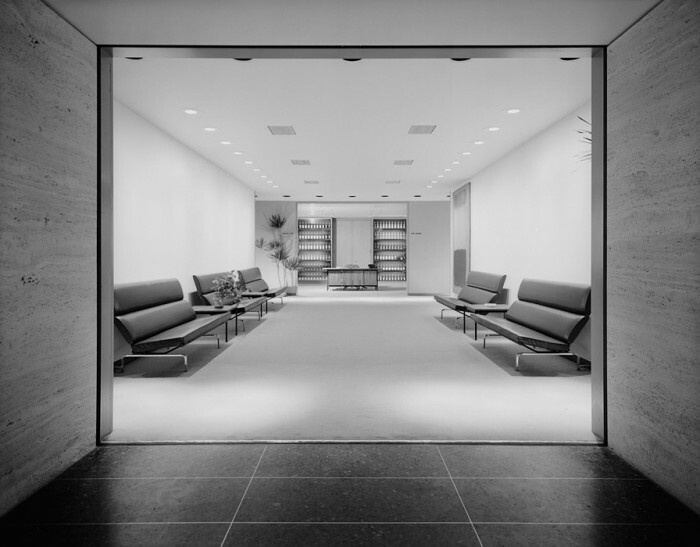 Ezra Stoller’s gelatin silver prints include images of architectural interiors and iconic landmarks. Based on his background in architecture and industrial design, Stoller used a large-format camera to photograph monumental 20th century buildings, including the Guggenheim Museum, the TWA terminal at Idlewild Airport (now John F. Kennedy International Airport), the Seagram Building, the Salk Institute, Yale Art and Architecture Building and Fallingwater. In addition to well-known photographs of these locations, the exhibition will include lesser-known photographs of small homes and guest houses which provide a fresh look at the masterful eye that established Stoller as the preeminent photographer of modern architecture. Ezra Stoller was born in Chicago in 1915 and graduated from New York University in 1938. He worked briefly with the photographer Paul Strand in the Office for Emergency Management before being drafted in 1942 into the U.S. Army, where he taught photography at the Army Signal Corps Photo Center in Long Island City. During his long career, he also photographed factories and technical facilities as well as residential projects. In 1961, he became the first photographer to be awarded the American Institute of Architects Gold Medal. His photographs have been exhibited internationally and belong to numerous museum collections, including The Whitney Museum of American Art; The Museum of Fine Arts, Houston; the High Museum of Art, Atlanta; and the San Francisco Museum of Modern Art.